How do people take good photos of ice-cream?!? Please forgive the ridiculousness of this recipe, it was dreamed up in the midst of a crazy fog of exhaustion & pain. All I could think about was raspberry ripple ice-cream with maple syrup instead of cheap raspberry jam. Slowly, over the course of many days obsessing, that simple concept grew to encompass bourbon & gingerbread cookie dough. I thought it was going to be too much when I first made it - I thought no-one would be able to cope with it & that it would be crazy. It actually works better together than you would think...although the bourbon is probably optional. Technically this isn't an ice-cream, it's a Semifreddo which is a kind of frozen mousse thing from Italy. 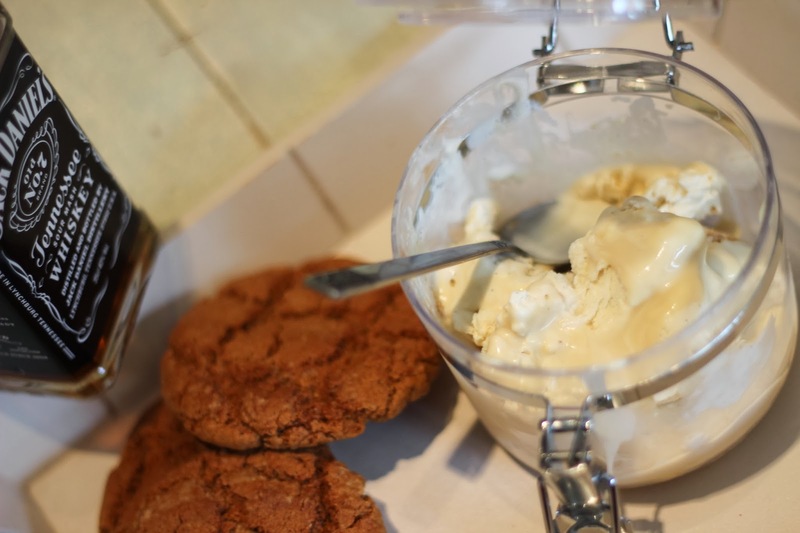 It's also the best way I have found of making great quality ice-cream without an ice-cream maker (I actually have an ice-cream maker but when I wake up on a morning with an overwhelming need to make ice-cream, the ice-cream maker is seldom ready). & has great texture. My brother's comment the first time I made it was that it was 'just like shop bought'...not flavour-wise but consistency wise. If you have a compromised immune system you probably know better than I do how much raw egg you should be having, I would assume that you shouldn't be eating this although my immune system is not great & seems to be coping...but then again my greed probably plays a part in that lol. Heat the maple syrup until a smoking boil (when the bubbles of boiling maple syrup burst & release a little steam/smoke stuff). Pour in the double cream & stir until everything is fully combined. Remove from the heat & allow to cool. Place the cookie-dough dry ingredients into a bowl & rub through the margarine. Stir in the sugar & honey & then refrigerate. Break into bite-sized pieces for the ice-cream & bake any remaining dough at 200 C, 400 F or Gas Mark 6 until just cooked. For the ice-cream get out 3 bowls, putting the cream in the largest, the egg whites in one bowl & the egg yolks in the last one. Whisk the egg whites with the cream of tartar until medium stiff peaks form. Whisk the egg yolks, sugar, vanilla bean paste & maple extract until doubled in volume & much paler. 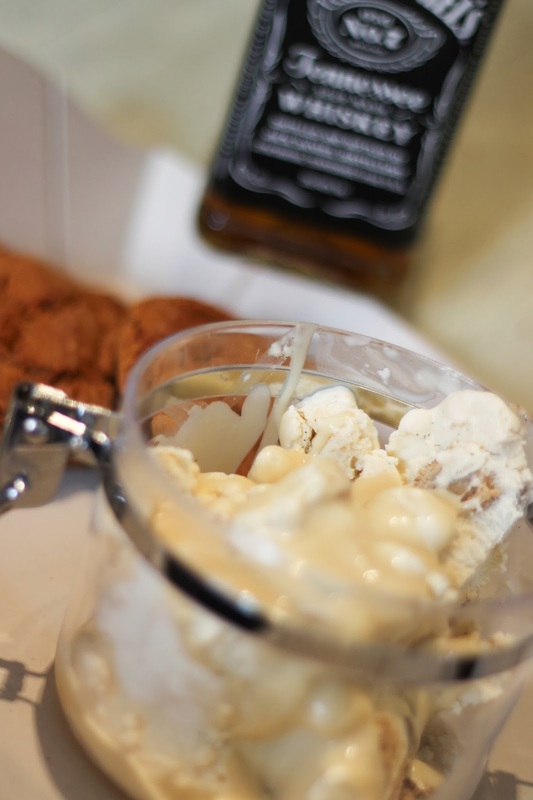 Whip the cream with the bourbon until soft peaks form. Fold the egg yolk mixture into the cream. Fold in the egg whites one third at a time until fully combined, taking care not too knock out too much air. If you have any of the maple syrup caramel left, it is great to serve with the ice-cream but it is also CRAZY addictive. I could literally eat it with a spoon....I have literally eaten it with a spoon. Is that gross? Oh my goodness...that sounds so yummy!! !